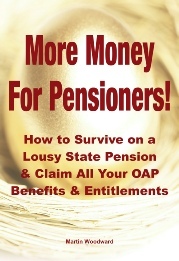 Completed late January 2014 and updated after the March budget, this book has been written specifically to help struggling UK pensioners increase their income and reduce their expenditure. Easy to read, very informative and entertaining! Whether you are income rich and property poor; or property rich and income poor; or just poor - this book will help improve your life! ALL IN ALL A GOLDMINE OF INFORMATION THAT I’M SURE WILL BENEFIT ALL UK PENSIONERS - AT A BARGAIN PRICE! Currently only available on Amazon Kindle -works with their free IOS or Android app!